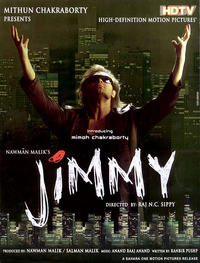 Review Summary: JIMMY is a poor show all the way. The script disappoints not the star-kid [Mimoh]. And so the queasy question is: How’s Mimoh? Let’s just say, give him another chance. This one was anything but. The story is outdated the direction is tardy the performances sloppy and the film yawn-inducing. Sad but it seems there was no one to counsel the young Mimoh. There are words you've heard consistently in films of the '70s and '80s – karz, brain tumour, bete ka farz and the widowed mother squealing 'beta nashta to karte ja'. JIMMY is a poor show all the way. The script disappoints not the star-kid [Mimoh]. And the entire film reveals itself in the first half hour. Pathetic and poor!!! Better off not watching it. Jimmy is one of the worst movies in recent times. One of the many debuts this year is of Mithun Chakraborthy's son Mimoh who was apparently supposed to make his debut with another film 'HE'. Though we haven't heard of that film which was also to be the launch for Hansika Mowani , Jimmy now comes as Mimoh's official launch pad.